The widgetsphere is roughly divided into two camps. There are desktop widgets like Apple Dashboard Widgets, Windows Gadgets, and Yahoo Widgets that act as standalone mini-apps that pull in data from the Web. And there are Web widgets like Google Gadgets or countless others that act as standalone mini-apps that you can add to Web pages such as iGoogle, Facebook, MySpace, blogs, etc. Amnesty Hypercube, an application from Mesa Dynamics that launched today in beta, is trying to bridge those two camps. 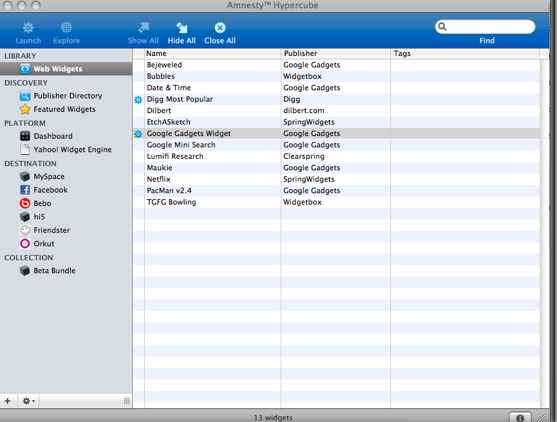 For those who prefer the clutter of desktop widgets, Hypercube converts Web widgets into desktop widgets. It also converts desktop widgets back into Web widgets so that you can put your favorite widget into Facebook, MySpace, Hi5, Friendster, or Orkut. This lets you mix and match widgets from different sources through a single management console. I tried it and launched a Google News gadget, a widget that shows top Diggs, and some games. If you are widget crazy, and your current desktop widget platform does not support the widgets you want, this could be helpful. You can take your favorite Web widget and turn it into a desktop widget. Although, most of the major widget platforms already have a wide and overlapping choice of widgets. 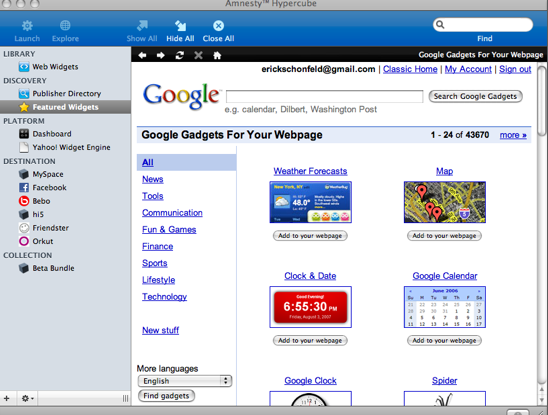 And some, like Google Gadgets, support both desktop and Web widgets. The free software download works only fro Mac OS X now, but a Windows version is coming in August.